Make an opening in the bottom hem, slide in a penny or two, and sew the hem back up to keep curtains hanging level and stick-straight. If you dine out and the table is unsteady, put a coin under the leg to restore balance. Misplaced the thimble? No problem. 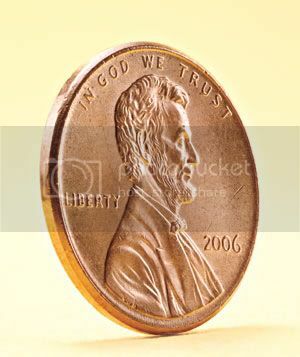 Sub in a cent. Use a penny to screw open a toy’s battery pack. Hand out pennies at your next gathering and ask each guest to share a story that happened during the year his or her penny was minted. If the coin predates a friend, let the person improvise. To ward off algae, toss in a few pre-1982 coins; the high copper content retards growth.